Alpha Warranty is proud to announce an exciting new upgrade to some of our most popular plans. 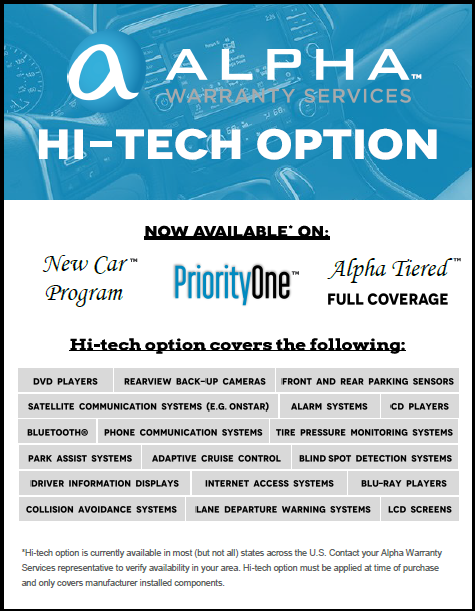 Because of the number of high tech innovations found in vehicles today, Alpha now provides the option to have your hi-tech gadgets covered with your vehicle service contract. This Hi-tech option provides greater value for vehicles needing protection on high their tech components. AWS has added a new Hi-Tech Option available on 3 of our exclusionary coverage plans. We are dedicated to Delivering the Unexpected and providing an unrivaled customer experience and this new option improved your vehicle coverage. For more details on the Hi-Tech Option, see below. An option that when applied covers the following manufacturer installed components: DVD players, Blu-ray players, CD players, LCD screens, front and rear parking sensors, rearview back-up cameras, Bluetooth® and other phone communication systems, alarm systems, collision avoidance systems, satellite communication systems (e.g., OnStar), driver information displays, internet access systems, lane departure warning systems, blind spot detection systems, park assist systems, tire pressure monitoring systems, adaptive cruise control. Does not cover remote controls, headphones, discs. The Hi-tech option is currently available in most states across the U.S. Buyers will see the option available when purchasing a qualified plan. We are working to make it available in these states as soon as possible. We will make an announcement as soon as it becomes available in these states.